We’ve put together some of our easiest crochet granny squares and you’re in for a treat. These free patterns are cute, perfect for beginner crocheters, and great for quick projects. 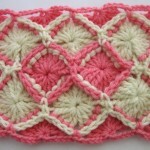 You can’t go wrong with easy crochet granny square patterns! These are just a few of the many easy squares you’ll find in this pattern page. 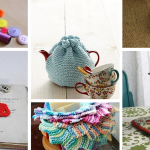 What’s great about granny squares is that there are so many different varieties and ways to crochet them. So if one pattern is a little more difficult than you expected, you can try a different one. Crocheting takes practice and it’s always refreshing to crochet a nice, simple, granny square. 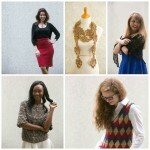 Here are some of my favorites from the list! You can see all the patterns here and tell us which one is your favorite! 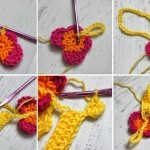 Basic Rectangle Granny – This is such a cute rectangle granny square and it’s a great beginner pattern. Using an H hook and worsted weight yarn, this rectangle granny is 6 inches by 8 inches when complete. However, you can make this rectangle larger by just continuing with the pattern. I’ve heard plenty of people learn how to crochet a granny square for the first time and then ended up crocheting around and around until they ended up with a big granny square blanket. 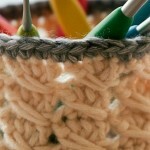 It’s a great idea and a good way to practice your stitches. 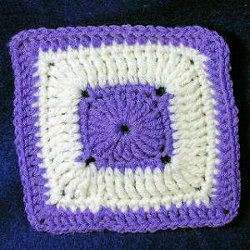 April Square – I might be partial to this square since my birthday is in April and every time I see this pattern I smile. 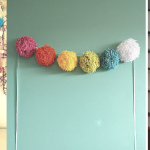 Nonetheless, this is an easy pattern that uses two colors in a relatively simple way. 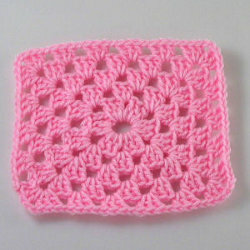 This square crochets up quickly so it’s great for granny square afghans that need to be done in a timely manner. Popcorn Lace 12″ Afghan Square – This is a 12-inch square so it’s a little bigger than the ones above. It’s very easy to crochet in just 10 rounds of basic stitches. I like this square because of it’s lacy structure which makes it great for lighter throws. 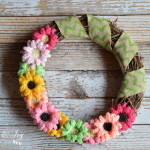 You could also crochet a bunch of these to make a lightweight baby blanket too. Be sure to check out 46 Easy Crochet Granny Square Patterns for these squares and all of the rest of these great patterns that you don’t want to miss! If you’re more of a follow along type of learner, check out these videos on how to create a gorgeous Granny square! 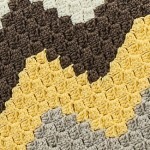 You’ll love the construction and colors of the Happy Harlequin Crochet Afghan. We can’t get over how very cheerful this pattern is! How often do you crochet granny squares? That is awesome! I am doing the same! Thank you as a re-fresher course I find these helpful, forget ch in between 2 or 3 etc. I would crochet them everyday if I could find an easy to remember pattern….just beginning to learn this technique and I have made 9 so far, but I want to be able to do this from memory, not while watching a video…..So I am hoping I can find one here so I can do this everyday until I have enough to make a blanket/afghan….. This is awesome! I just learned how to crochet and I was able to make all of them! I make granny square afghans with 4 other ladies and also guys at the Jail and we give them away to people in need. I always have trouble making mine exactly the same size, and joining them together. It always turns out a bit wonky, but I guess I just need to work on my tension? Love having lots of choices to try out! I like trying different squares, sometimes different yarn types/weights. Of course they don’t come out the same size. How can I combine them into a “crazy quilt” afghan when they’re all different sizes? My sister-in-law started a farm afghan in blocks and diamonds she cannot finish it and I cannot find the pattern. I would like to finish it for her.